Salvinorin A is the main active psychotropic molecule in Salvia divinorum, a Mexican plant which has a long history of use as an entheogen by indigenous Mazatec shamans. Salvinorin A is considered a dissociative hallucinogen. It is structurally distinct from other naturally occurring hallucinogens (such as DMT, psilocybin, and mescaline) because it contains no nitrogen atoms; hence, it is not an alkaloid (and cannot be rendered as a salt), but rather is a terpenoid. It also differs in subjective experience, compared to other hallucinogens, and has been described as dissociative. Salvinorin A can produce psychoactive experiences in humans with a typical duration of action being several minutes to an hour or so, depending on the method of ingestion. Salvinorin A is found with several other structurally related salvinorins. Salvinorin is a trans–neoclerodane diterpenoid. It acts as a kappa opioid receptor agonist and is the first known compound acting on this receptor that is not an alkaloid. Salvinorin A was first described and named in 1982 by Alfredo Ortega and colleagues in Mexico. They used a combination of spectroscopy and x-ray crystallography to determine the chemical structure of the compound, which was shown to have a bicyclic diterpene structure. Around the same time, Leander Julián Valdés III independently isolated the molecule as part of his PhD research, published in 1983. Valdés named the chemical divinorin, and also isolated an analog that he named divinorin B. The naming was subsequently corrected to salvinorin A and B after the work was published in 1984. Valdés later isolated salvinorin C.
Salvinorin A is a trans-neoclerodane diterpenoid with the chemical formula C23H28O8. Unlike other known opioid-receptor ligands, salvinorin A is not an alkaloid, as it does not contain a basic nitrogen atom. Salvinorin A has no action at the 5-HT2A serotonin receptor, the principal molecular target responsible for the actions of ‘classical’ psychedelics such as LSD and mescaline. Salvinorin A is active at doses as low as 200 µg. Synthetic chemicals, such as LSD (active at 20–30 µg doses), can be more potent. Research has shown that salvinorin A is a potent κ-opioid receptor (KOR) agonist (Ki = 2.4 nM, EC50 = 1.8 nM). It has a high affinity for the receptor, indicated by the low dissociation constant of 1.0 nanomolar (nM). It has been reported that the effects of salvinorin A in mice are blocked by κ-opioid receptor antagonists. In addition, salvinorin A has recently been found to act as a D2 receptor partial agonist, with an affinity of 5–10 nM, an intrinsic activity of 40–60%, and an EC50 of 48 nM. This suggests that the D2 receptor may also play an important role in its effects. Salvinorin A shows atypical properties as an agonist of the KOR relative to other KOR agonists. For instance, it is 40-fold less potent in promoting internalization (receptor downregulation) of the human KOR relative to the prototypical KOR agonist U-50488. Salvinorin A is capable of inhibiting excess intestinal motility (e.g. diarrhea), through its potent κ-opioid-activating effects. The mechanism of action for salvinorin A on ileal tissue has been described as ‘prejunctional’, as it was able to modify electrically induced contractions, but not those of exogenous acetylcholine. A pharmacologically important aspect of the contraction-reducing properties of ingested salvinorin A on gut tissue is that it is only pharmacologically active on inflamed and not normal tissue, thus reducing possible side-effects. Salvinorin A is soluble in organic solvents such as ethanol and acetone, but not especially so in water. Humans who smoked 580 μg of the pure drug had urine salvinorin A concentrations of 2.4–10.9 µg/L during the first hour, but the levels fell below the detection limit by 1.5 hours after smoking. Analytical measurements may be performed using gas or liquid chromatography-mass spectrometry. Many other terpenoids have been isolated from Salvia divinorum, including other salvinorins and related compounds named divinatorins and salvinicins. None of these compounds have shown significant (sub-micromolar) affinity at the kappa-opioid receptor, and there is no evidence that they contribute to the plant’s psychoactivity. The biogenic origin of salvinorin A synthesis has been elucidated using nuclear magnetic resonance and ESI–MS analysis of incorporated precursors labeled with stable isotopes of carbon (Carbon-13 13C) and hydrogen (Deuterium 2H). It “is biosynthesized via the 1-deoxy-d-xylulose-5-phosphate pathway,” rather than the classic mevalonate pathway, consistent with the common plastidial localization of diterpenoid metabolism. Terpenoids are biosynthesized from two 5-carbon precursors, isopentenyl diphosphate (IPP) and dimethylallyl diphosphate (DMAPP). The NMR and MS study by Zjawiony suggested that the biosynthesis of salvinorin A proceeds via the 1-deoxy-d-xylulose-5-phosphate pathway. In the deoxyxylulose phosphate pathway, D-glyceraldehyde 3-phosphate and pyruvate, the intermediates of the glycolysis, are converted into 1-deoxy-D-xylulose 5-phosphate via decarboxylation. 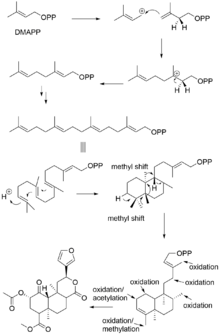 Subsequent reduction with NADPH generates 2C-methyl-D-erythritol 2,4-cyclodiphosphate, via the intermediates 4-diphosphocytidyl-2-C-methyl-D-erythritol and 4-diphosphocytidyl-2c-methyl-d-erythritol-2-phosphate, which then lead to IPP and DMAPP. Subsequent addition of three 5-carbon IPP units to a single 5-carbon DMAPP unit generates the 20-carbon central precursor, geranylgeranyl diphosphate (GGPP). Bicyclization of GGPP by the class II diterpene synthase, ent-clerodienyl diphosphate synthase (SdCPS2), produces an Iabdanyl diphosphate carbocation, which is subsequently rearranged through a sequence of 1,2-hydride and methyl shifts to form the ent-clerodienyl diphosphate intermediate. SdCPS2 catalyzes the first committed reaction in the biosynthesis of salvinorin A by producing its characteristic clerodane scaffold. A series of oxygenation, acylation and methylation reactions is then required to complete the biosynthesis of salvinorin A. Similar to many plant-derived psychoactive compounds, salvinorin A is excreted via peltate glandular trichomes, which reside external to the epidermis. A total asymmetric synthesis of salvinorin A, which relies on a transannular Michael reaction cascade to construct the ring system, was achieved as a 4.5% overall yield over 30 steps, then revised using 24 steps to yield salvinorin A in 0.15% yield. An approach to the trans-decalin ring system of salvinorin A used an intramolecular Diels-Alder reaction/Tsuji allylation strategy, and a total synthesis of salvinorin A was achieved using the intramolecular Diels-Alder / Tsuji allylation approach, combined with an asymmetric late-stage addition of the furan moiety. Salvinorin A is one of several structurally related salvinorins found in the Salvia divinorum plant. Salvinorin A can be synthesized from the inactive salvinorin B by acetylation. The de-acetylated analog salvinorin B is devoid of human activity. 2-Mexothymethyl salvinorin B is five- and seven-fold more potent at KOPr in GTP-γS assays than U50,488 and Salvinorin A, respectively. Salvinorin A seems to be the only active naturally occurring salvinorin. Salvinorin J is most closely related to salvinorin E in structure, with a C-17 secondary alcohol instead of a ketone group. Research on salvinorin derivatives has produced a number of semi-synthetic compounds, several of which can be conveniently made from salvinorin B. Most derivatives are selective kappa opioid agonists as with salvinorin A, although some are even more potent, with the most potent compound 2-ethoxymethyl salvinorin B being 10x stronger than salvinorin A. Some derivatives, such as herkinorin, reduce kappa opioid action and instead act as mu opioid agonists. Salvinorin A has only been administered to humans in a few studies, one showing that its effects peaked at about 2 minutes, that its subjective effects may overlap with those of serotonergic psychedelics, and that it temporarily impairs recall and recognition memory. Like most other agonists of kappa opioid receptors, salvinorin A produces sedation, psychotomimesis, dysphoria, anhedonia, and depression. Salvinorin A is under preliminary research for its possible use as a scaffold in medicinal chemistry to develop new drugs for treating psychiatric diseases, such as addiction from cocaine dependence. Salvinorin A is sometimes regulated together with its host, Salvia divinorum, due to its psychoactive and analgesic effects. Salvinorin A is not scheduled at the federal level in the United States. Its molecular structure is unlike any Schedule I or II drug, so possession or sales is unlikely to be prosecuted under the Federal Analogue Act. Salvinorin A is considered a Schedule 9 prohibited substance in Australia under the Poisons Standard (October 2015). A Schedule 9 substance is a substance which may be abused or misused, the manufacture, possession, sale or use of which should be prohibited by law except when required for medical or scientific research, or for analytical, teaching or training purposes with approval of Commonwealth and/or State or Territory Health Authorities. Sveriges riksdags health ministry Statens folkhälsoinstitut classified salvinorin A (and Salvia divinorum) as “health hazard” under the act Lagen om förbud mot vissa hälsofarliga varor (translated Act on the Prohibition of Certain Goods Dangerous to Health) as of Apr 1, 2006, in their regulation SFS 2006:167 listed as “salvinorin A”, making it illegal to sell or possess. ^ a b c d e Butelman, E. R; Kreek, M. J (2015). “Salvinorin A, a kappa-opioid receptor agonist hallucinogen: Pharmacology and potential template for novel pharmacotherapeutic agents in neuropsychiatric disorders”. Frontiers in Pharmacology. 6: 190. doi:10.3389/fphar.2015.00190. PMC 4561799. PMID 26441647. ^ a b MacLean, Katherine; Johnson, Matthew; Reissig, Chad; Prisinzano, Thomas; Griffiths, Roland (March 2013). “Dose-related effects of salvinorin A in humans: dissociative, hallucinogenic, and memory effects”. Psychopharmacology. 226 (2): 381–392. doi:10.1007/s00213-012-2912-9. PMC 3581702. PMID 23135605. ^ a b c Roth BL; Baner K; Westkaemper R; Siebert D; Rice KC; Steinberg S; Ernsberger P; Rothman RB (2002). “Salvinorin A: a potent naturally occurring nonnitrogenous κ opioid selective agonist”. Proceedings of the National Academy of Sciences of the United States of America. 99 (18): 11934–9. doi:10.1073/pnas.182234399. PMC 129372. PMID 12192085. ^ Ortega A; Blount JF; Manchard PD. (1982). “Salvinorin, a new trans-neoclerodane diterpene from Salvia divinorum (Labiatae)”. Journal of the Chemical Society, Perkin Transactions 1: 2505–8. doi:10.1039/P19820002505. ^ Valdés LJJ III (1983). The pharmacognosy of Salvia divinorum (Epling and Jativa-M): An Investigation of Ska Maria Pastora (Mexico) (PhD thesis). University of Michigan. ^ Valdés III LJJ; Butler WM; Hatfield GM; Paul AG; Koreeda M. (1984). “Divinorin A, a psychotropic terpenoid, and divinorin B from the hallucinogenic Mexican mint Salvia divinorum“. Journal of Organic Chemistry. 49 (24): 4716–20. doi:10.1021/jo00198a026. ^ Valdés III LJJ; Chang HM; Visger DC; Koreeda M. (2001). “Salvinorin C, a new neoclerodane diterpene from a bioactive fraction of the hallucinogenic Mexican mint Salvia divinorum“. Organic Letters. 3 (24): 3935–7. doi:10.1021/ol016820d. PMID 11720573. ^ a b c Prisinzano TE (2005). “Psychopharmacology of the hallucinogenic sage Salvia divinorum“. Life Sciences. 78 (5): 527–31. doi:10.1016/j.lfs.2005.09.008. PMID 16213533. ^ a b Harding WW; Schmidt M; Tidgewell K; Kannan P; Holden KG; Gilmour B; Navarro H; Rothman RB; Prisinzano TE (2006). “Synthetic studies of neoclerodane diterpenes from Salvia divinorum: semisynthesis of salvinicins A and B and other chemical transformations of salvinorin A”. Journal of Natural Products. 69 (1): 107–12. doi:10.1021/np050398i. PMC 2544632. PMID 16441078. ^ Imanshahidi M; Hosseinzadeh H (2006). “The pharmacological effects of Salvia species on the central nervous system”. Phytotherapy Research. 20 (6): 427–37. doi:10.1002/ptr.1898. PMID 16619340. However, when smoked (in a manner similar to free base cocaine), the compound is effective in doses of 200–500 μg and produces visions that last from 30 minutes to an hour or two, while doses over 2 mg are effective for much longer. At doses greater than 500 μg the subject is often no longer aware of their surroundings and may enter an uncontrollable delirium. This compound is the most potent naturally occurring hallucinogen thus far isolated. Marushia, Robin (2002). “Salvia divinorum: The Botany, Ethnobotany, Biochemistry and Future of a Mexican Mint” (PDF). Ethnobotany. Archived from the original (PDF) on October 7, 2007. Retrieved 2006-12-23. ^ Greiner T; Burch NR; Edelberg R (1958). “Psychopathology and psychophysiology of minimal LSD-25 dosage; a preliminary dosage-response spectrum”. AMA Archives of Neurology and Psychiatry. 79 (2): 208–10. doi:10.1001/archneurpsyc.1958.02340020088016. PMID 13497365. ^ Lee D; Ma Z; Liu-Chen L; Wang Y; Chen Y; Carlezon W; Cohen B. (2005). “New neoclerodane diterpenoids isolated from the leaves of Salvia divinorum and their binding affinities for human K opioid receptors”. Bioorganic and Medicinal Chemistry. 13 (19): 5635–9. doi:10.1016/j.bmc.2005.05.054. PMID 16084728. ^ Zhang Y; Butelman ER; Schlussman SD; Ho A; Kreek MJ (2005). “Effects of the plant-derived hallucinogen salvinorin A on basal dopamine levels in the caudate putamen and in a conditioned place aversion assay in mice: agonist actions at kappa opioid receptors”. Psychopharmacology. 179 (3): 551–8. doi:10.1007/s00213-004-2087-0. PMID 15682306. ^ a b Seeman P; Guan HC; Hirbec H (2009). “Dopamine D2High receptors stimulated by phencyclidines, lysergic acid diethylamide, salvinorin A, and modafinil”. Synapse. 63 (8): 698–704. doi:10.1002/syn.20647. PMID 19391150. ^ Linda P. Dwoskin (29 January 2014). Emerging Targets & Therapeutics in the Treatment of Psychostimulant Abuse. Elsevier Science. pp. 483–. ISBN 978-0-12-420177-4. ^ Capasso R; Borrelli F; Capasso F; Siebert DJ; Stewart DJ; Zjawiony JK; Izzo AA (2006). “The hallucinogenic herb Salvia divinorum and its active ingredient salvinorin A inhibit enteric cholinergic transmission in the guinea-pig ileum”. Neurogastroenterology and Motility. 18 (1): 69–75. doi:10.1111/j.1365-2982.2005.00725.x. PMID 16371085. ^ Capasso R; Borrelli F; Zjawiony J; Kutrzeba L; Aviello G; Sarnelli G; Capasso F; Izzo AA (2007). “The hallucinogenic herb Salvia divinorum and its active ingredient salvinorin A reduce inflammation-induced hypermotility in mice”. Neurogastroenterology and Motility. 20 (2): 142–8. doi:10.1111/j.1365-2982.2007.00994.x. PMID 17931335. ^ “Salvia divinorum”. European Monitoring Centre for Drugs and Drug Addiction. Retrieved 4 September 2014. Salvinorin A is unstable in basic solutions and is soluble in conventional organic solvents, including acetone, acetonitrile, chloroform, dimethyl sulfoxide and methanol, but is essentially insoluble in hexane and water. ^ Pichini S; Abanades S; Farré M; Pellegrini M; Marchei E; Pacifici R; Torre Rde L; Zuccaro P (2005). “Quantification of the plant-derived hallucinogen salvinorin A in conventional and non-conventional biological fluids by gas chromatography/mass spectrometry after Salvia divinorum smoking”. Rapid Communications in Mass Spectrometry. 19 (12): 1649–1656. doi:10.1002/rcm.1970. ISSN 1097-0231. PMID 15915477. Salvinorin A was not detected in urine samples collected from 1.5–9.5 h after smoking, probably because of a dilution effect, which yielded concentrations below the LOD obtainable with this methodology. ^ Bigham AK; Munro TA; Rizzacasa MA; Robins-Browne RM (2003). “Divinatorins A-C, new neoclerodane diterpenoids from the controlled sage Salvia divinorum“. Journal of Natural Products. 66 (9): 1242–4. CiteSeerX 10.1.1.693.6690. doi:10.1021/np030313i. PMID 14510607. ^ a b Munro TA; Rizzacasa MA (2003). “Salvinorins D-F, new neoclerodane diterpenoids from Salvia divinorum, and an improved method for the isolation of salvinorin A”. Journal of Natural Products. 66 (5): 703–5. doi:10.1021/np0205699. PMID 12762813. ^ Kutrzeba L; Dayan FE; Howell J; Feng J; Giner JL; Zjawiony JK (2007). “Biosynthesis of salvinorin A proceeds via the deoxyxylulose phosphate pathway”. Phytochemistry. 68 (14): 1872–81. doi:10.1016/j.phytochem.2007.04.034. PMC 2065853. PMID 17574635. ^ Pelot, Kyle A.; Mitchell, Rod; Kwon, Moonhyuk; Hagelthorn, David M.; Wardman, Jacob F.; Chiang, Angela; Bohlmann, Jörg; Ro, Dae-Kyun; Zerbe, Philipp (2017-03-01). “Biosynthesis of the psychotropic plant diterpene salvinorin A: Discovery and characterization of the Salvia divinorum clerodienyl diphosphate synthase”. The Plant Journal. 89 (5): 885–897. doi:10.1111/tpj.13427. ISSN 1365-313X. PMID 27865008. ^ Kunkle D (2007). “Leaf glandular trichome (Salvia divinorum)”. Dennis Kunkel Microscopy, Inc. Retrieved 2011-10-14. ^ Scheerer JR; Lawrence JF; Wang GC; Evans DA (2007). “Asymmetric synthesis of salvinorin A, a potent kappa opioid receptor agonist”. Journal of the American Chemical Society. 129 (29): 8968–9. doi:10.1021/ja073590a. PMID 17602636. ^ Nozawa M; Suka Y; Hoshi T; Suzuki T; Hagiwara H (2008). “Total synthesis of the hallucinogenic neoclerodane diterpenoid salvinorin A”. Organic Letters. 10 (7): 1365–8. doi:10.1021/ol800101v. PMID 18311991. ^ Burns AC; Forsyth CJ. (2008). “Intramolecular Diels−Alder/Tsuji allylation assembly of the functionalized trans-decalin of salvinorin A”. Organic Letters. 10 (1): 97–100. doi:10.1021/ol7024058. PMID 18062692. ^ Line, N.; Burns, A. C.; Butler, S. C.; Casbohm, J.; Forsyth, C. J. (2016). “Total Synthesis of (−)-Salvinorin A”. Chem. Eur. J. 22 (50): 17983–17986. doi:10.1002/chem.201604853. PMID 27758012. ^ Wang, Y.; Chen, Y.; Xu, W.; Lee, D.; Ma, Z; Rawls, S.; Cowan, A.; Liu-Chen, L. (2008). “2-methoxymethyl-salvinorin B is a potent kappa opioid receptor agonist with longer lasting action in vivo than salvinorin A.” Journal of Pharmacology and Experimental Therapeutics. 324 (3): 1073–1083. doi:10.1124/jpet.107.132142. PMC 2519046. PMID 18089845. ^ White K, Robinson JE, Zhu H, et al. (2014). “The G-protein biased k-opioid receptor agonist RB-64 is analgesic with a unique spectrum of activities in vivo”. J. Pharmacol. Exp. Ther. 352 (1): 98–109. doi:10.1124/jpet.114.216820. PMC 4279099. PMID 25320048. ^ Kutrzeba L; Ferreira Z (2009). “Salvinorins J from Salvia divinorum: mutarotation in the neoclerodane system”. Journal of Natural Products. 72 (7): 1361–3. doi:10.1021/np900181q. PMID 19473009. ^ Munro TA; Duncan KK; Xu W; Wang Y; Liu-Chen LY; Carlezon WA; Cohen BM; Béguin C (2008). “Standard protecting groups create potent and selective κ opioids: salvinorin B alkoxymethyl ethers”. Bioorganic & Medicinal Chemistry. 16 (3): 1279–86. doi:10.1016/j.bmc.2007.10.067. PMC 2568987. PMID 17981041. ^ Holden KG; Tidgewell K; Marquam A; Rothman RB; Navarro H; Prisinzano TE (2007). “Synthetic studies of neoclerodane diterpenes from Salvia divinorum: exploration of the 1-position”. Bioorganic & Medicinal Chemistry Letters. 17 (22): 6111–5. doi:10.1016/j.bmcl.2007.09.050. PMC 2111044. PMID 17904842. ^ Lee DY; He M; Liu-Chen LY; Wang Y; Li JG; Xu W; Ma Z; Carlezon WA; Cohen B (2006). “Synthesis and in vitro pharmacological studies of new C(4)-modified salvinorin A analogues”. Bioorganic & Medicinal Chemistry Letters. 16 (21): 5498–502. doi:10.1016/j.bmcl.2006.08.051. PMID 16945525. ^ Béguin C; Richards MR; Li JG; Wang Y; Xu W; Liu-Chen LY; Carlezon WA; Cohen BM (2006). “Synthesis and in vitro evaluation of salvinorin A analogues: effect of configuration at C(2) and substitution at C(18)”. Bioorganic & Medicinal Chemistry Letters. 16 (17): 4679–85. doi:10.1016/j.bmcl.2006.05.093. PMID 16777411. ^ MacLean, K. A.; Johnson, M. W.; Reissig, C. J.; Prisinzano, T. E.; Griffiths, R. R. (2012). “Dose-related effects of salvinorin a in humans: Dissociative, hallucinogenic, and memory effects”. Psychopharmacology. 226 (2): 381–392. doi:10.1007/s00213-012-2912-9. PMC 3581702. PMID 23135605. ^ Parker L. Mott (2 December 2011). A Literature Review on the Status and Effects of Salvia Divinorum on Cognitive, Affective, and Behavioral Functioning. Universal-Publishers. pp. 27–. ISBN 978-1-61233-777-7. ^ José Biller (2008). The Interface of Neurology & Internal Medicine. Lippincott Williams & Wilkins. pp. 681–. ISBN 978-0-7817-7906-7. ^ Orton, E; Liu, R (2014). “Salvinorin A: A Mini Review of Physical and Chemical Properties Affecting Its Translation from Research to Clinical Applications in Humans”. Translational Perioperative and Pain Medicine. 1 (1): 9–11. PMC 4208627. PMID 25346937. ^ Kivell, B. M; Ewald, A. W; Prisinzano, T. E (2014). Salvinorin a analogs and other kappa opioid receptor compounds as treatments for cocaine abuse. Advances in Pharmacology. 69. pp. 481–511. doi:10.1016/B978-0-12-420118-7.00012-3. ISBN 9780124201187. PMC 4128345. PMID 24484985. ^ “Förordning om ändring i förordningen (1999:58) om förbud mot vissa hälsofarliga varor (Swedish)” (PDF). Svensk författningssamling. 2006. Baselt, Randall C. (2008). Disposition of Toxic Drugs and Chemicals in Man (8th ed.). Foster City, CA: Biomedical Publications. pp. 1405–6. ISBN 978-0- 9626523-7-0.